I’ve been going a little crazy with sloth pictures of late, so this post ISN’T about sloths, but about another adorable animal — the Golden Lion Tamarin. A new baby was born at the Adelaide Zoo on October 13th to parents Aurora and Rio. The little baby tamarin is the seventh child of Aurora, so joins its six siblings, who will help to care for the newest member of the family. Since Golden Lion Tamarins are on the endangered species list and among the rarest animals on the Earth, the birth of any of these small new world monkeys is something to be celebrated. The little monkey born in Adelaide will be named once the gender has been determined, a few months from now as it must cling tight to its mother at present. And will have a name of South American origin starting with ‘A’ if a girl and ‘R’ if a boy after its parents. The little tyke is just starting to open its eyes and is about 10cm in length and weighs about 100g. The yellow coloring to its fur makes it unique from its siblings as their hair is the more traditional reddish-orange. 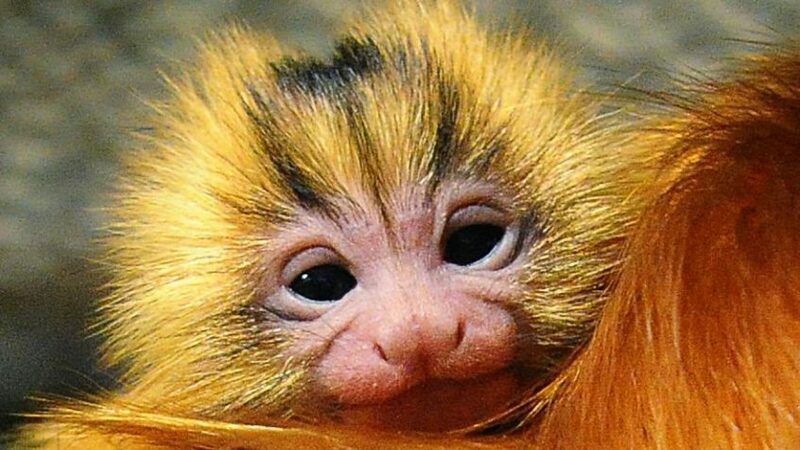 I imagine our little Rin, from Timmy and the Golden Lion Tamarin was just as adorable at this age.